WASHINGTON -- April 6, 2007 -- The Arab American Institute (AAI) and Arab Americans across the country are deeply saddened by the hateful anti-Arab epithets that were spray painted on the Holy Apostolic Catholic Assyrian Church of the East in Warren, Mich., during what is the holiest week for the Christian community. This attack magnifies the divides, created by fear and ignorance, which still must be bridged. It is distressing and an affront to our nation's core values that these church members were targets of attack because of their Middle East heritage. News reports suggest that the church community may victimized because the perpetrators thought the house of worship was a Mosque -- a notion that is equally troubling to the Arab American community. AAI commends the Michigan Department of Civil Rights for swiftly implementing an investigation and offering its assistance to the church and the surrounding community. AAI also calls on the FBI to investigate the vandalism as a hate crime. On the face of it, this appears to be a thoughtful and considerate sentiment, but given AAI's history of misrepresenting Assyrians (also known as Chaldeans and Syriacs) as Arabs, the statement is disingenuous and politically opportunistic. Shortly after the 9/11 attacks AAI began circulating press material on the identity of Arab Americans (AINA 10-5-2001). This material explicitly stated that Assyrians are ethnically Arab. After a storm of protests from Assyrians, Maronites and Copts -- all non-Arab groups from the Middle East -- and an unprecedented joint communiqué (AINA, 10-27-2001) from these three groups, AAI removed all references to Assyrians from its material and website and agreed to stop identifying Assyrians as Arabs. That should have been the end of the story. AAI, however, settled on a different tactic. We also include Arabic-speaking persons who identify as Assyrian/Chaldean, Somali or Sudanese, identities which are not aggregated as Arab in Census reports. It appears that the footnote on the web page is there merely to placate the casual Assyrian reader. The separate State reports are, on the other hand, what journalists, public officials and policy makers would print and read and distribute to other interested persons. In the report for the State of Illinois the pie chart on the right is shown. This is taken from the U.S. Census Bureau. 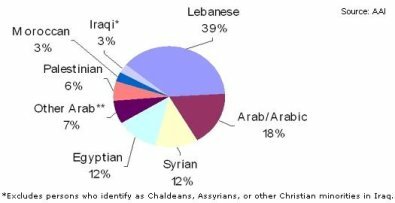 The U.S. Census has a category for Assyrians (482-489) that is separate from the Arab category (400-415, 417-418, 421-430, 435-481, 490-499). Why is AAI in this report lumping Assyrians in with the Arabs? Does it know better than the U.S. Census? The AAI's Demographics page has a section called Religion, which shows the pie chart shown here on the left. This is fundamentally flawed and glosses over crucial distinctions between Christians and Muslims from the Middle East. The overwhelming majority of Muslims from the Middle East are indeed Arabs, but the overwhelming majority of Christians are not Arabs. The Maronites of Lebanon do not consider themselves as Arabs, and neither do the Copts of Egypt as well as the Assyrians from Iraq, Syria Turkey and Iran. 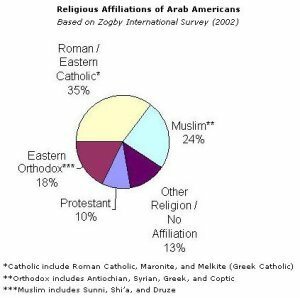 This graph is misleading because it includes the non-Arab Christians, which artificially inflates the number of "Arab" Americans. The graph should show only those who identify themselves as Christian and Arab. The AAI press release says "...Arab Americans across the country are deeply saddened by the hateful anti-Arab epithets that were spray painted...." This is a continuation of AAI's deliberate policy of identifying Assyrians as Arabs. The epithets were not anti-Arab, they were anti-Assyrian, and a genuine statement from AAI would have said that. As for this press statement: thanks, Arab American Institute, but no thanks. The practical ramifications of the AAI's desire to usurp Assyrian identity are by no means trivial. By counting Assyrians and other Middle Eastern Christian groups as Arabs, AAI attempts to enhance its demographic and, by extension, political clout in the U.S. This enhanced Arab political clout may then be used to further an agenda that is at best alien and sometimes outright hostile to Assyrian self-awareness and aspirations. 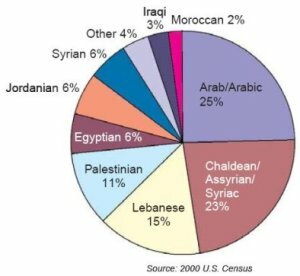 Arab American demographic claims illegitimately bolstered by Assyrian numbers may also be used to vie for grants, financial assistance, and services otherwise destined for the Assyrian community to instead further Arab cultural, linguistic, social welfare, and nationalist goals.